This Kit Rae Original design is an adult collectible from his renowned Swords of the Ancients mythological collection. The 29" stainless steel fantasy-style blade features intricate decorative etchings and unique curves. Vorenthul's leather-wrapped handle features a Samurai-style hilt fitted with a double guard and a pointed hook pommel on the end. 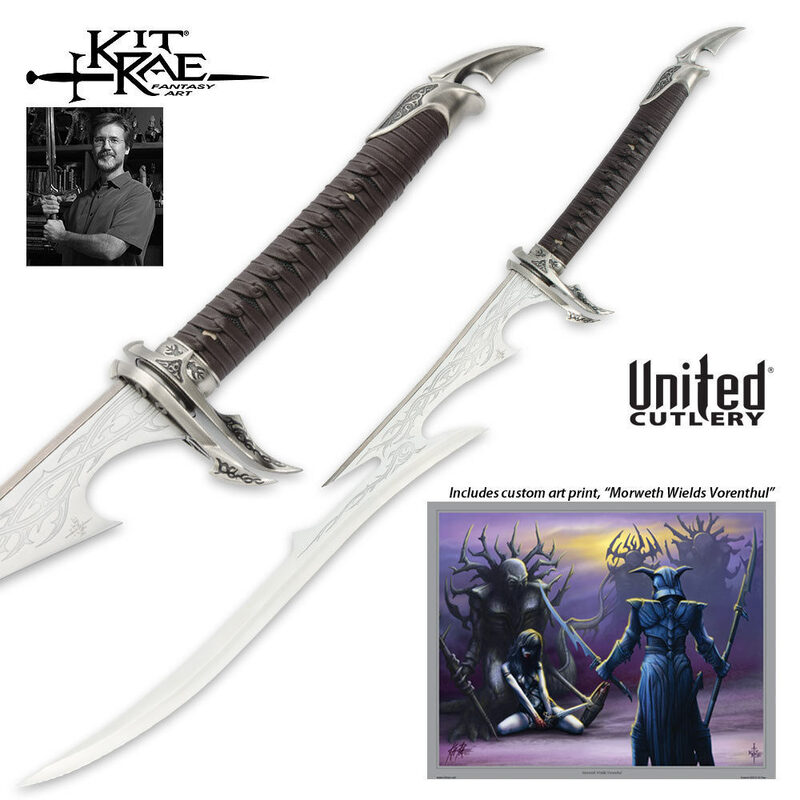 This fantasy adult collectible is strictly limited to 2000 pieces worldwide and includes a certificate of authenticity and a custom art print autographed by Kit Rae. 42-1/2" overall length. I loved how it looked when I got it in, cool design I thought. it had good weight to it (almost 3lb's) a quality sword, great buy for any collector of Kit Rae. This is a nice sword. I have had lots of positive comments on it. I'm look forward to additional items of this quality. This sword is cool....the blade takes a little time to get use to the look of it....but it grows on you...lol...I received a very low serial #...under 100...so that was super cool plus the hand sign art print...was extremely pleased....definitely recommend it as I would all of Kit Rae's products!!! I just got this in the mail....I LOVE IT!!! Amazing craftsmanship, perfect balance, cant wait to get the other two.